Ensure the preferred options are enabled then click OK. 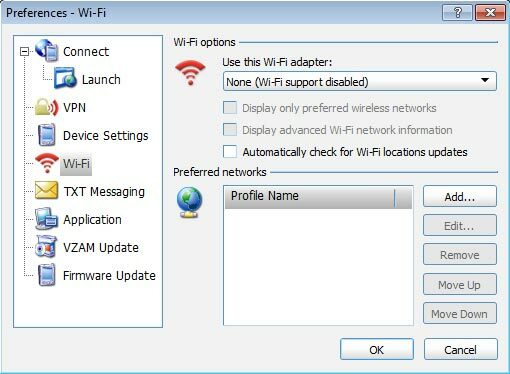 Ensure the preferred Wi-Fi adapter is selected. Displays only preferred networks in the main screen. Displays additional wireless network information (Channel, MAC address and type of security) in the main screen. VZAccess Manager checks for updates to the Wi-Fi locations listing. Listing of previous Wi-Fi network connections.